Graduation Invitation Challenge — Timber! Have you ever wanted a custom-made invitation without having to do a ton of work? Something that is very personal to you? Many Stampin’ Up! demonstrators (demos for short) are called upon to create cards for their customer’s major life events. Included in these creations might be special birthdays, baby showers, weddings (YouTube How To by Akiko Hyodo) and retirements. At my recent card buffet, my friend Mary and her daughter Deb challenged me to come up with some ideas for a graduation invitation utilizing the Stampin’ Up! Wood You Be Mine? stamp set. 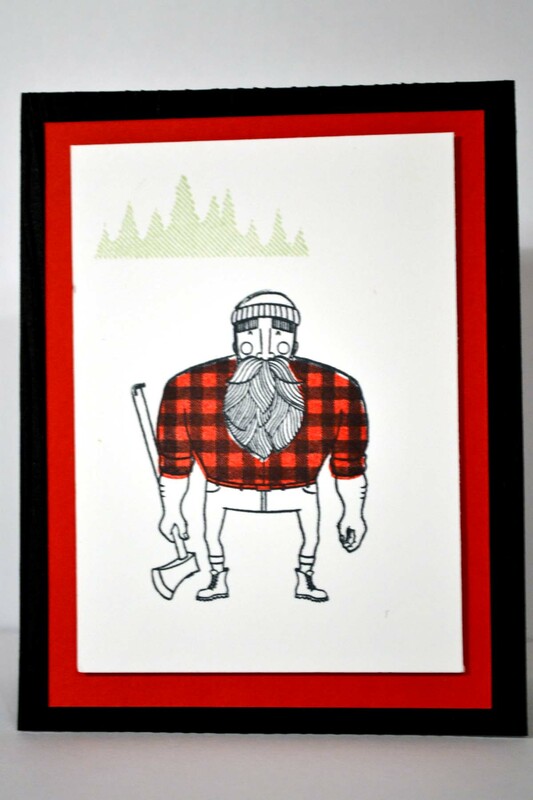 This set features a lumberjack which just happens to be the mascot for Wausau East High School, where Deb’s son will be graduating from in a few months. The school colors are red and black and are featured in these cards as well. Here are four ideas that were developed. 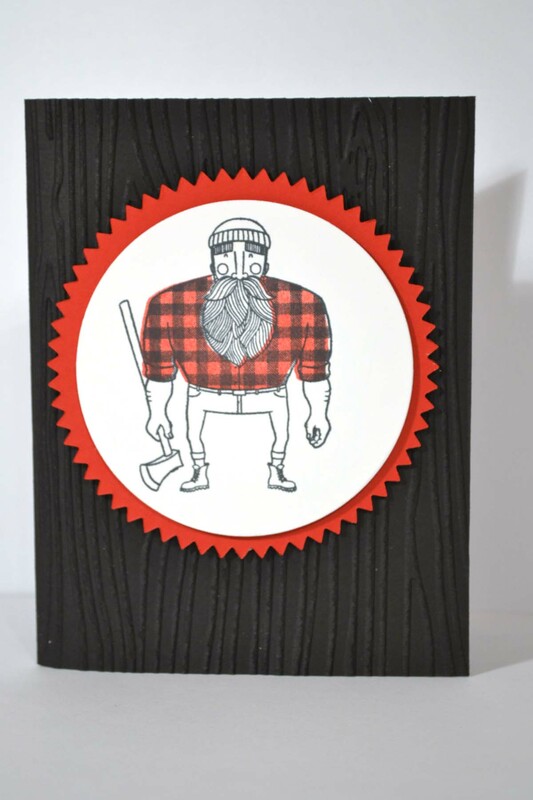 This card uses a black card base with a woodgrain stamped in white followed by a splash of red with the final layer of the lumberjack stamped on winter white. The winter white was cut out utilizing the Starburst Framelits Die to add the illusion that the lumberjack is on a saw blade. This card utilizes a black card base that was embossed with the Woodgrain Texture Impressions Embossing Folder topped with the rectangular red and white card stock. The embossed woodgrain can be seen better in the image above. The slice of wood is featured on the inside of each card to carry the Wood You Be Mine? theme throughout the cards. 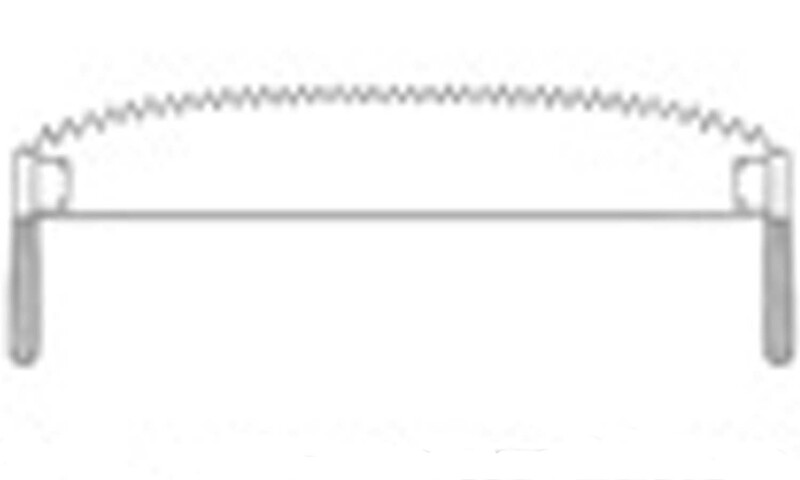 Wouldn’t it be fun to stamp the saw blade onto the envelopes? 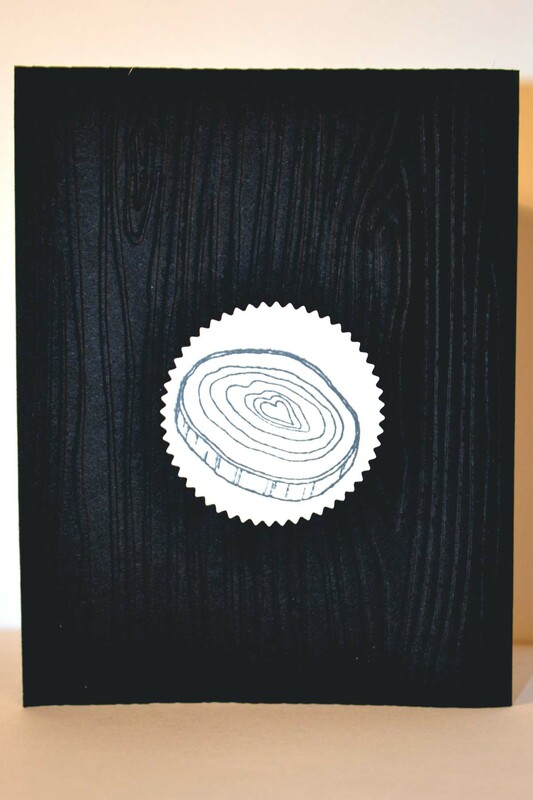 This card again features a black card base with the white woodgrain stamped on top of it. 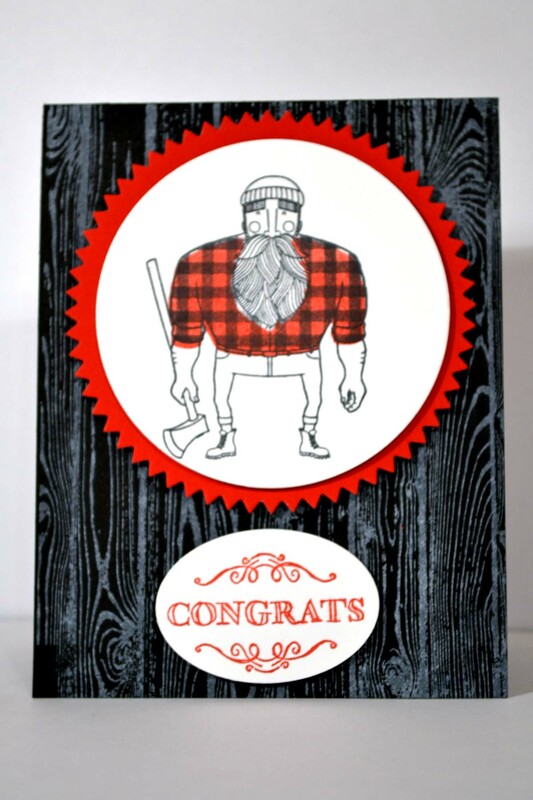 This is followed up with a red saw blade, the lumberjack along with the sentiment “congrats” added to the card. 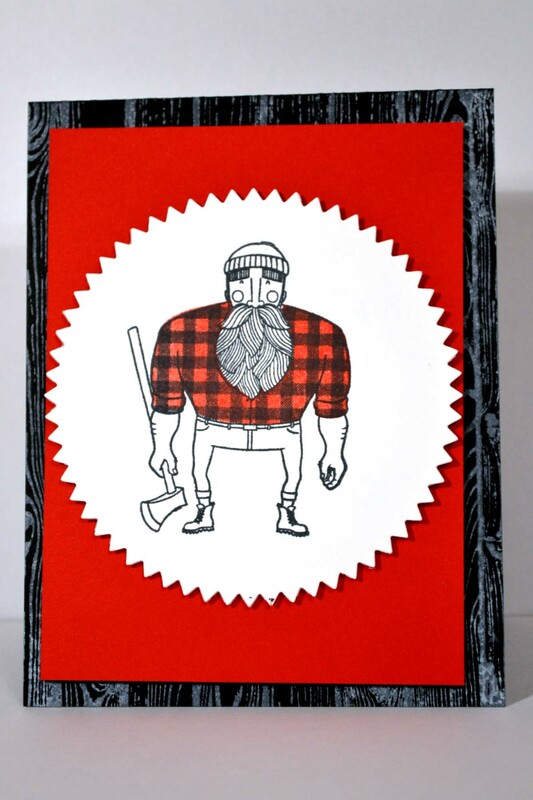 The last card features the embossed card base followed by the red saw blade layer with the lumberjack perched on top. Which do you like best? Vote for your favorite by adding a comment at the bottom. I will share the results in a future blog. Save the date for my next card buffet to be held on Saturday, April 25 from 9 a.m. to 1 p.m. Let me know if you are coming so I have enough supplies on hand. Add a note in the comment section letting me know of your interest.